Nancy Lord poses at the "Reflections on Attu" exhibit in Anchorage. This year marks the seventy-fifth anniversary of the battle of Attu, and this summer Homer will be able to remember the only battle fought on American soil during World War II with an art exhibition. 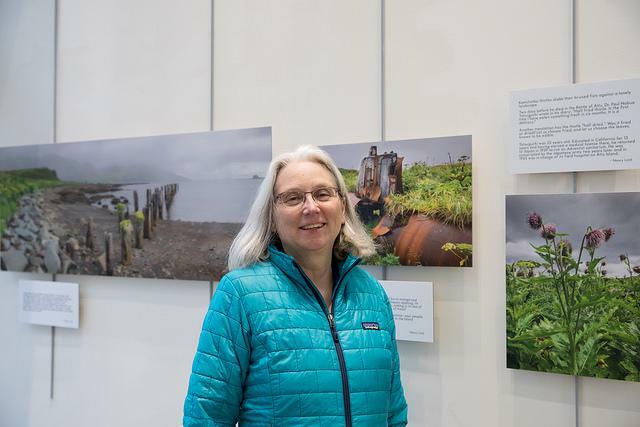 “Reflections on Attu” features three artists who visited the Aleutian Islands as part of the Voices of the Wilderness Artist-in-Residence Program. Homer resident Nancy Lord and Irene Owsley of New Mexico spent a week in Adak and roughly a week traveling and visiting Kiska and Attu. Owsley took pictures and Lord wrote accompanying essays. “So we were kind of looking with an eye toward the beauty that we could find amidst the damages and the very sad history out there of the loss of the village of Attu and all the military people on both sides who died on Attu, and all the war wreckage that’s still out there scarring the land,” she said. The battle of Attu was part of “The Aleutian Campaign” sometimes referred to as the “The Forgotten War.” American and Japanese troops fought for nearly a month in 1943 for control of Attu Island. Nearly all of the roughly 2,500 Japanese soldiers who fought in the battle died along with about 550 U.S. soldiers. Before the battle, Japanese soliders took residents of Attu, called Unangax, as prisoners of war. Those who survived were not allowed to return to their homes even after the fighting ended. Owsley, who took photographs, hopes to remind her audience of Attu’s human history. The photo that stands out to her is one that seems at first just to show the island's mountainous terrain. “But then if you look very closely you'll see revetments and sort of series of tracks that were roads at one point and round, they looked like almost bomb craters but they weren't, they were the revetments, the remnants of huts and buildings that were used in World War II,” she said. The exhibition was first shown in Anchorage during a three-day commemoration for the seventy-fifth anniversary. It included a series of films, lectures, exhibits and other events. U.S. veterans, Unangax community members and decedents of Japanese veterans attended. Andrea Nelson, who makes art out of found objects, said it was nerve-racking to present the show. Nelson spent ten days on Attu Island collecting sand, rock and plant life and wove them together with different World War II materials such as bandages and flight goggles. She hopes to broaden the audience’s association with the island. “I guess the most important thing they realize is that Attu is a place bigger than the battle there and the history is much larger,” she said. The U.S. Fish and Wildlife Service Alaska Maritime National Wildlife Refuge is presenting the opening reception for the exhibition Friday from 5-7 p.m. at the Islands and Oceans Visitor Center. Writer Nancy Lord will give a presentation at 7 p.m.